This graphic organizer is designed to help students make connections while reading. We can make connections: Text - to - Self Text - to - Text Text - to - World Thank you for downloading! As always, feedback is appreciated! A graphic organizer used to solidify connections made while reading. Students will use it to record their text evidence and connections made. Can be text to self, world, or another text. Start out by modeling with read aloud/think aloud process. This is a graphic organizer I use during my Guided Reading unit. Students reflect on three different types of connections within their Guided Reading text: text to text, text to self,and text to world. The need to defend two examples for each type. This item contains text-to-text, text-to-self and text-to-world graphic organizers. Each organizer contains a checklist to help struggling students make connections to their text. A simple and editable graphic organizer for students to use when working on the Making Connections reading strategy! 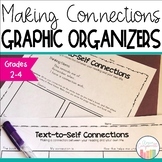 Use the graphic organizer with paired texts to support making connections between texts. This is a simple graphic organizer for making connections. This can be edited to fit any grade, but I made it specifically for 3rd/4th grade. Enjoy! Help students organize thinking and connections with this graphic organizer! Students will retell the problem and solution of the story, make a connection, and draw a picture.